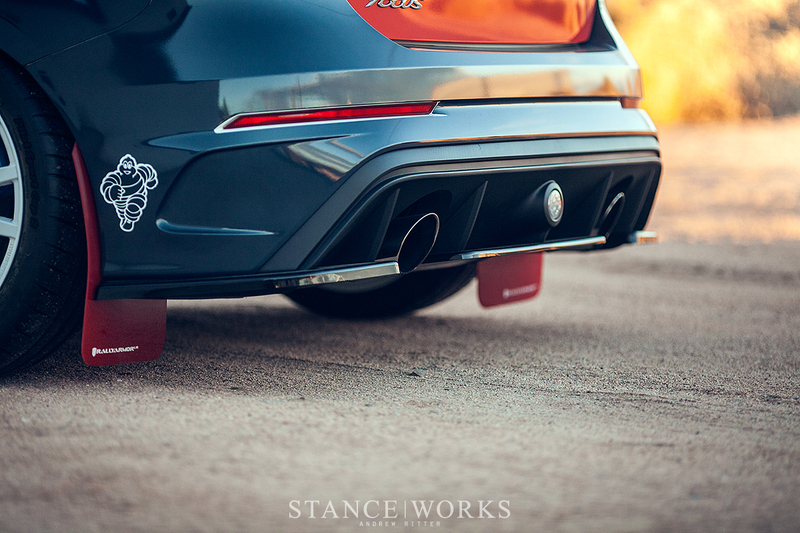 Believe it or not, it's not all vintage cars here at the StanceWorks HQ. While over the past few years, Andrew and I have done little to bring new steel through the shop door, it doesn't come unwelcome. 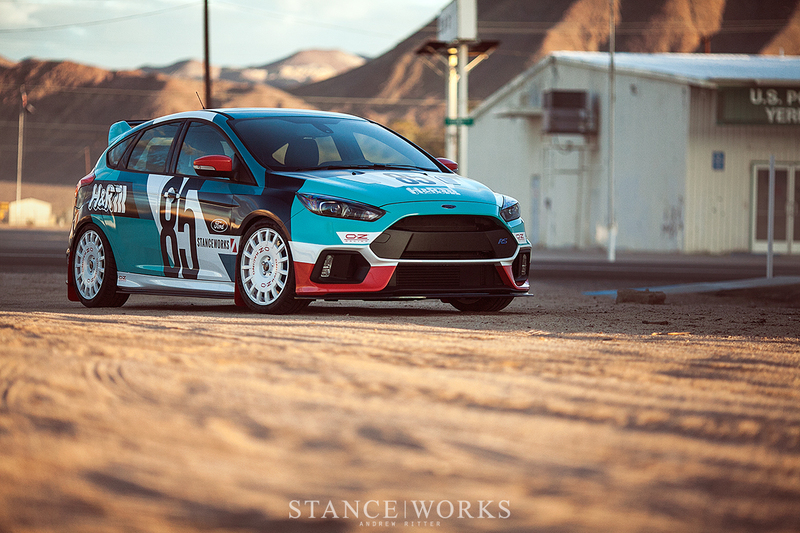 Just a handful of weeks ago, the team at H&R dropped off their latest project vehicle: the all-new Focus RS, and along with it came free reign to do as we liked... Well, to some degree, at least. The plans were set in stone months ago: the car was to debut in the Ford booth at the SEMA show, arguably the most prominent display on the 2-million square foot convention center floor. 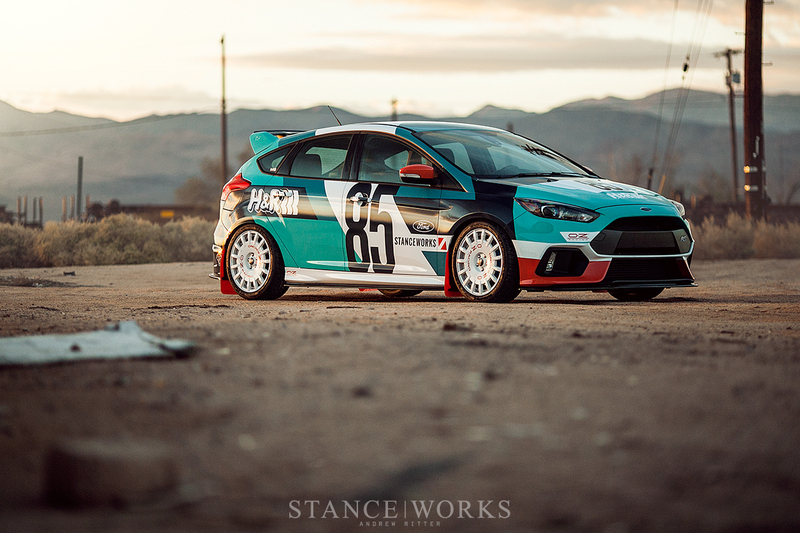 While our initial plans included more horsepower, less interior, cagework, and an honest attempt to transform our RS into a true rally car, a number of factors forced us to adjust our hand, playing the cards we were dealt. Taking delivery of the car less than a month before its debut, we worked quickly and diligently to showcase our ideas in design and style. The first changes to the car were, of course, the suspension components. 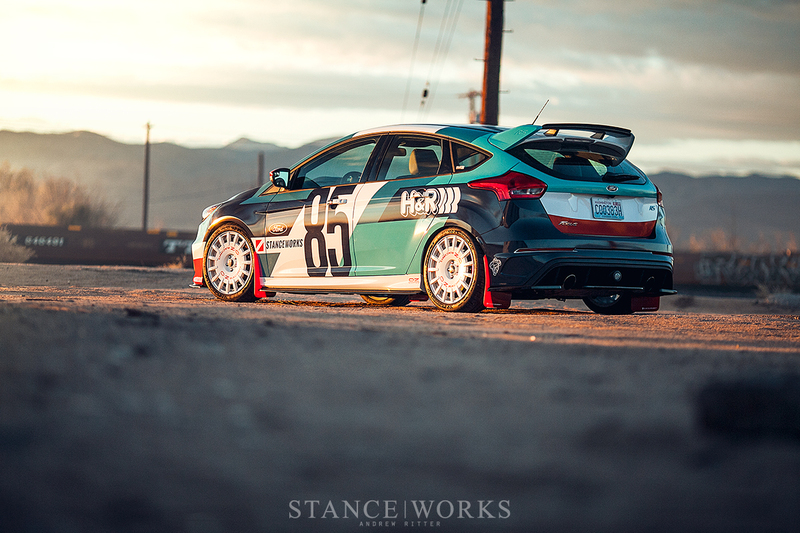 H&R wasted no time swapping the stock gear in favor of a custom set of their RSS coilovers, set up to maximize the Focus RS's handling characteristics. With the car's all wheel drive offering unprecedented levels of traction, H&R equipped the car with the best components they offer, including dynamic damping, along stiffer-than-standard spring rates and shock valving. Following that, we set out to design a livery, and after much deliberation, we settled on a design inspired by a handful of classic racers, including the famous Ford Sierra Cosworth. Of course drawn my Andrew himself, the livery plays off of both the car's classic history, and its new, modern aesthetics. The colorway is bright but tidy, playing off of the color palettes that have withstood the test of time from our favorite era of racing. 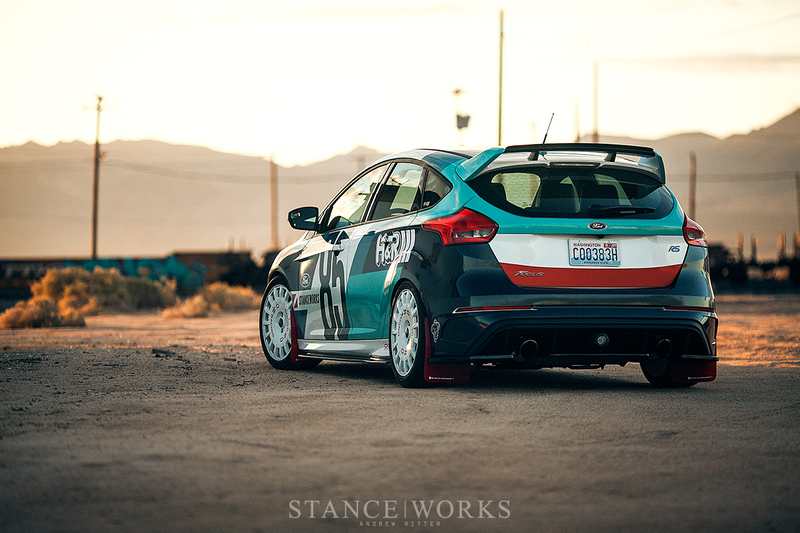 After the designs were finalized, the car was taken over to Wrapworks. After a bit of deliberation on how to make the graphics fit the shape of the car correctly, and of course, line up, the Wrapworks team did what they do best, and just two days later, the car was back in our possession. 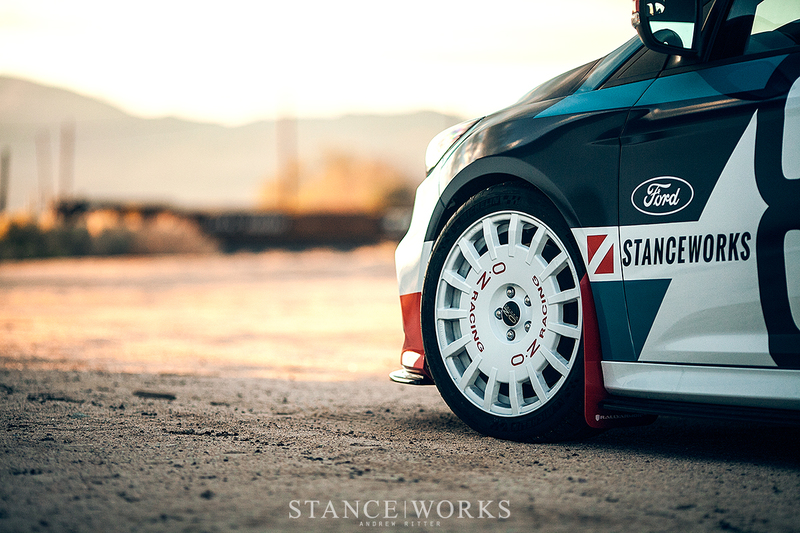 Wanting to nail the rally aesthetic, there was no better wheel option than the iconic OZ Racing. After hearing our plans, we received the very-first set of their latest rally wheel, with the official debut happening on our very own project. Measuring out to 18x9 on all four corners, we made the conscious decision to drop the factory wheel diameter by an inch, in favor of that proper, classic rallysport look. The OZ logos were done in a livery-matching red-orange, and to finish out the setup, the wheels are wrapped in Michelin Pilot Sport Cup 2s in 235/40/18 square. 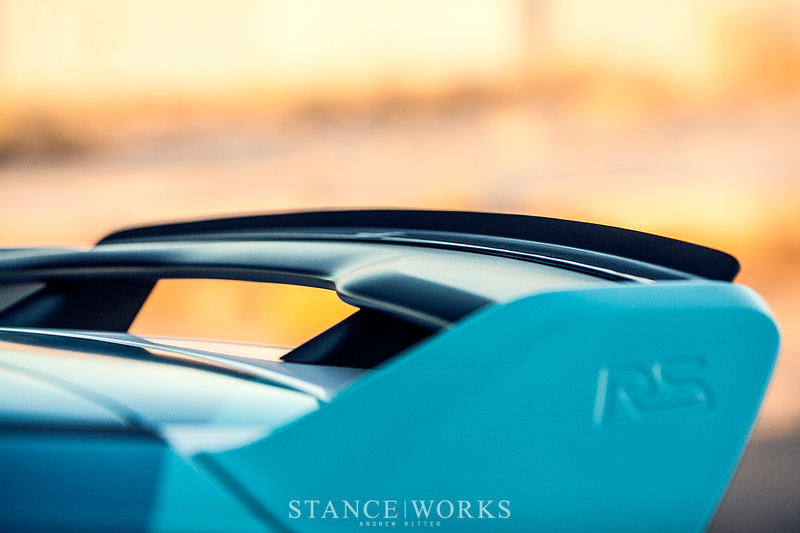 Beyond that, it's the small touches that help to complete the car. 2nd-generation RS hood vents add the perfect amount of flair to the top half of the car, and a euro RS rear diffuser and rear fog light give a nice OEM+ touch to the rear for fellow Ford geeks. Maxton Design aero components - the front splitter, a rear diffuser add-on, a gurney flap for the spoiler, and side skirt extensions - surround the car. Rally Armor mudflaps help to seal the deal, amongst a few other small odds and ends, here and there. Overall, the car offered us a chance to exercise our design talents, and in record time, no less. As quickly as the car arrived, it left, and it's on to its next stage in life; once again, the SW HQ is reduced to its classic cars and nothing but. However, maybe we can convince Ford to give us a car of our own next year, huh guys?